Eirik Verås Larsen has won three Olympic medals and five world championships in kayak paddling, but he had to step out of the spotlight in favour of his wife Mira last week. That’s when she was the one chosen to carry Norway’s flag at the opening ceremonies for the Summer Olympics in London over the weekend. 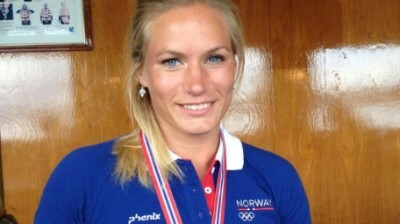 Her kayak had already been sent over to London, but Larsen hadn’t planned to attend the opening ceremonies, opting to stay in Norway to keep training until it was time to leave for her part of the competition. She said she was as surprised as anyone that she was chosen to carry the flag, which resulted in her taking a quick trip over the North Sea to do her duty. That’s pretty much what Jarle Aambø, Norway’s top athletics chief, said when he explained the Norwegian Olympic committee’s choice. He called Mira Verås Larsen “a good representative for Norwegian athletics,” and noted that her great-grandfather won Norway’s very first Olympic gold medal, at the summer games in Athens in 1906. When she’s not paddling on the fjord Larsen studies engineering within biotechnology and chemistry at the College of Oslo (Høgskolen i Oslo). The 25-year-old member of Strand Kayak Club spends quite a bit of time paddling, though, and won three Norwegian championships in 2009. “It’s a dream to take part in the Olympics,” she told newspaper Dagsavisen. She didn’t spend much time in London, however, traveling home right after the opening ceremonies to continue training until it’s her turn to compete.